Christmas in July with "Be The Star"
The new Be the Star stamp set is so versatile! I've used it for children's birthday cards, sports scrapbook pages, and even Christmas projects. 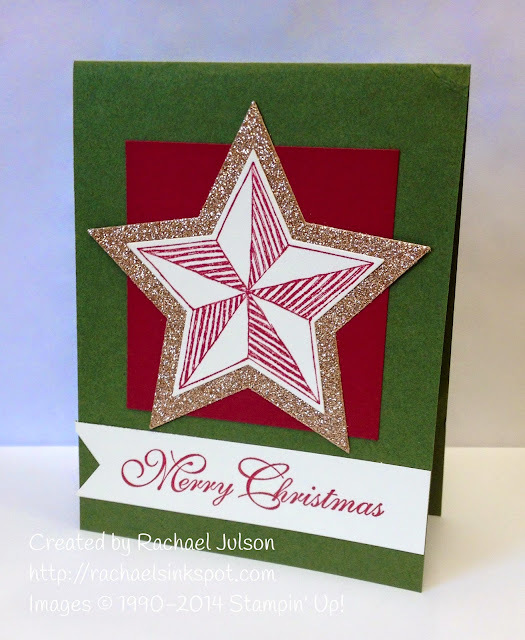 Today I'm sharing a simple, but beautiful Christmas card that I made using both the stamp set and the matching Star Framelits dies. I am obsessed with the way that I can use the Framelits to layer a variety of sizes of stars on my projects. The layer of champagne glitter paper just really makes that stamped star POP! The greeting was stamped using the Greetings of the Season stamp set, which is not in the catalog, but still available for purchase. Get it now before it's gone!